You can now go around Beirut without getting lost. As part of their Middle East and Northern Africa package, Lebanon is now covered in Garmin GPS device map. Even though it is not as detailed as other countries, the map includes major metropolitan coverage for Lebanon. You can download the map at $199.99 USD from Garmin’s website here. Posted: April 11th, 2010 under News, Technology. If you’ve been dreaming about flying a personal jetpack for way too long, then your wait is finally over! Jetlev Sports Inc. is proud to introduce the Jetlev-Flyer, the recreational jetpack almost anyone can enjoy over water. But just one thing, it’s priced around 130,000$. Posted: November 24th, 2009 under Entertainment, Technology. The internet regulator has approved plans to allow non-Latin-script web addresses, including Arabic, Chinese, in a move that is set to transform the online world. The board of Icann voted at its annual meeting in Seoul to allow domain names in Arabic, Chinese and other scripts. More than half of the 1.6 billion people who use the internet speak languages with non-Latin scripts. It is being described as the biggest change to the way the internet works since it was created 40 years ago. The first Internationalised Domain Names (IDNs) could be in use next year. Posted: November 2nd, 2009 under News, Technology. So one of James Bond gadgets is now true. Scientists from The Freie University of Berlin in Germany have developed an iPhone application that allows a car to be controlled by it. Of course, you cannot download it from the iPhone App Store. The scientists had to modify the car for that to work. Posted: November 2nd, 2009 under Technology. The weather in Canada is starting to get cold, and Seasonal Affective Disorder (SAD) - also known as “winter depression” or “winter blues” - is at the doorsteps. As I have brought to you last Winter a simple solution to combat SAD, I now introduce a new solution: the happy glasses. Developed in 2006 at the Liege University physics department in Belgium, the glasses are designed to stop the production of sleep hormone melatonin by shining light rays into the retina. Posted: October 27th, 2009 under Health, Technology. In December 2006, an Israeli company Lumus Ltd. developed a miniature projector that turns regular glasses into a personal video screen. Although the video image is clear to the wearer, the glasses appear normal to anyone else. Imagine the applications you can have with such glasses. Posted: October 27th, 2009 under Technology. A team of scientists from Italy and Sweden has developed what is believed to be the first artificial hand that has feeling. It has been attached to the arm of a 22-year-old man who lost his own hand through cancer. Researchers say it works by connecting human nerve endings with tiny electronic sensors. Even though it took them 10 years to get to this stage, this is a major advancement in simulating a human arm since the brain controls it without any muscular contraction. Posted: October 19th, 2009 under Research, Technology. A human X-ray machine that produces “naked” images of passengers has just started a trial at Manchester Airport. The authorities say it will speed up security checks by quickly revealing any concealed weapons or explosives. But the scanner also picks out the contours of every part of the body, not leaving much to the imagination. Posted: October 14th, 2009 under News, Technology. An electric battery-powered unicycle, shaped like a figure eight, has been unveiled in Japan last week. The unicycle unit U3-X, produced by Honda Motor Co, can be steered by leaning in the direction the rider wants to go. The vehicle, which is in the development stage, has a maximum speed of 6 km per hour (3.7 mph) and weighs less than 10 kilos. Posted: September 29th, 2009 under News, Technology. Electronic cigarettes (e-cigarettes): an alternative for smokers ? My first and only experience with e-cigarettes was last year because I was very curious in this small device when I first saw it with my friend Joumana. For those of you who do not know, an electronic cigarette (or “e-cigarette”) is an alternative to smoked tobacco products, such as cigarettes, cigars, or pipes. It is a battery-powered device that provides inhaled doses of nicotine by delivering a vaporized propylene glycol/nicotine solution. In addition to nicotine delivery, this vapor also provides a flavor and physical sensation similar to that of inhaled tobacco smoke, while no tobacco, smoke, or combustion is actually involved in its operation. When I tried the e-cigarette last year, I thought it was cool in the beginning, but turned out to be a hassle in the end. It didn’t give quite the feeling of smoking, and it wasn’t practical at all since I needed a couple of spare batteries for my night out. I am not sure how well they improved these devices, but I recently heard they are becoming more and more popular, and a wide variety of them exists now in the market. Posted: May 19th, 2009 under Health, Technology. Even though bankruptcy for GM (General Motors) is inevitable, its R&D department teamed up with Segway (the company behind the two-wheeled, self-balancing electric vehicle) to roll out an electric two-wheel, two-seat prototype vehicle in New York on Tuesday. Built for use in congested urban environments, Project P.U.M.A. (for Personal Urban Mobility and Accessibility), as the vehicle is called, combines several technologies demonstrated by GM and Segway. Such technologies include dynamic stabilization, electric propulsion, smart battery management, advanced sensing, and many more. The vehicle is built to carry two seated passengers at speeds of up to 56 km/h. Its 3-hour electric charge would cost about 0.45$, and it can travel over 50 km on a single charge. Energy consumption is estimated to be roughly equivalent to 200 MPG. Pricing wasn’t announced, but Larry Burns, GM’s VP of R&D and strategic planning, said in a statement that it would cost “one-fourth to one-third the cost of what you pay to own and operate today’s automobile”. GM said it hopes to have the vehicle in production by 2012. You can visit its official page at the Segway PUMA website. Posted: April 8th, 2009 under News, Technology. Nanotechnology is the study of the control of matter on an atomic and molecular scale. Generally nanotechnology deals with structures of the size 100 nanometers or smaller, and involves developing materials or devices within that size. Researchers are now focusing on nanotechnology to develop new cancer treatments that could one day replace radiation and chemotherapy. Scientists can use nano particles, created in the laboratory and delivered deep into the body, that would recognize, target, and kill tumor cells. Posted: March 24th, 2009 under Health, Research, Technology. Posted: March 23rd, 2009 under News, Technology. By definition, wireless power is the process where electrical energy is transmitted from a power source to an electrical load without any interconnecting wires. We are not used to see wireless power in our daily life, even most of us are not aware that it could be possible, but surprisingly enough, wireless power dates back to late 1800s. Last year, an MIT (Massachusetts Institute of Technology) professor by the name of Marin Soljačić has decided to work towards a world of wireless electricity. Wireless power has a long history that started in the late 19th century with the inventor Nikola Tesla, who had a grand scheme to beam elec­tricity around the world. he figured that wireless is the way to go, so he started designing and building a 57 meter long tower on Long Island that he claimed would transmit power to points kilometers away. Although he did some tests, funding ran out before the tower was completed. The promise of airborne power faded rapidly as the industrial world adopted wired electricity. 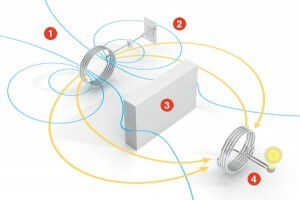 A couple of years ago, Soljačić started searching for ways to transmit power wirelessly. Instead of pursuing a long-distance scheme like Tesla’s, he decided to look for midrange power transmission methods that could charge - or even power - portabl­e devices such as cell phones, PDAs, and laptops. Soljačić eventually landed on the phenome­non of resonant coupling, in which two objects tuned to the same frequency exchange energy strongly but interact only weakly with other objects. He found magnetic resonance a promising means of electricity transfer because magnetic fields travel freely through air yet have little effect on the environment or, at the appropriate frequencies, on living beings. Working with MIT physics professors John Joannopoulos and Peter Fisher and three students, Soljačić built two resonant copper coils and hung them from the ceiling, about two meters apart. When they plugged one coil into the wall, alternating current flowed through it, creating a magnetic field. The second coil, tuned to the same frequency and hooked to a light bulb, reso­nated with the magnetic field, generating an electric current that lit up the bulb - even with a thin wall between the coils. Wireless power technology was regarded by the Technology Review magazine, published by the MIT, as one of the top 10 emerging technologies of 2008. Read more about it on the page of Marin Soljačić at the MIT website. Posted: March 9th, 2009 under Research, Technology. Seasonal Affective Disorder (SAD), also known as “winter depression” or “winter blues”, affects one in 10 people. I always believed that the brain neurotransmitters responsible for this are affected by weather conditions, but studies suggest that they are affected by latitude. All Canadians know that Winter is harsh in Canada, but we can now fortunately prevent a Winter depression. Light therapy can be a quick and simple solution. Two thirds of people with the SAD condition, sitting in front of a light device or light box, for thirty minutes every morning really alleviates most of their symptoms. The good thing is that results can come quickly, usually four to seven days. Posted: January 14th, 2009 under Health, Research, Technology.